The Revolt always looks forward to the Christmas lights being switched on in the village, and are veterans of many such occasions. And over the years the event has got bigger and more organised so that yesterday we had ‘Blackheath Village Day’ on a scale never before seen. And overall it was great success. This year there was a proper stage on Montpellier Green which was surrounded by stalls from the likes of Everest Inn and Chapters. And as in previous years there was also a stage outside The Crown and events at Blackheath Halls and throughout the village. Dozens of performers provided the entertainment with everything from gospel choirs, Nepalese dancers and Morris Men to lantern making and a board game workshop (which we thought best to avoid so as to avoid one Radical’s board game competitiveness emerging in a potential awkward manner). Seriously though, we really are lucky to have a day like this which brings together such an eclectic mix of cultural experiences set against the beautiful backdrop of our very own village. So, a huge thanks to all those who gave their time to entertain us and to everyone who helped organise the event. Our favourite, though it’s invidious of course to single anyone out, were the Blackheath Morris Men – who really went for it with their sticks and handkerchiefs, not to mention some classic ‘cracker jokes’, and in the process seemed to leave the crowd feeling as jolly as the dancers themselves. Spending the day in the village, starting with the excellent Royal Horse Artillery in the morning, it’s quite clear that the event generates lots more footfall and that the local traders were benefitting from this. Which is great and hopefully continues through the festive period, if not at the same levels as they day itself. 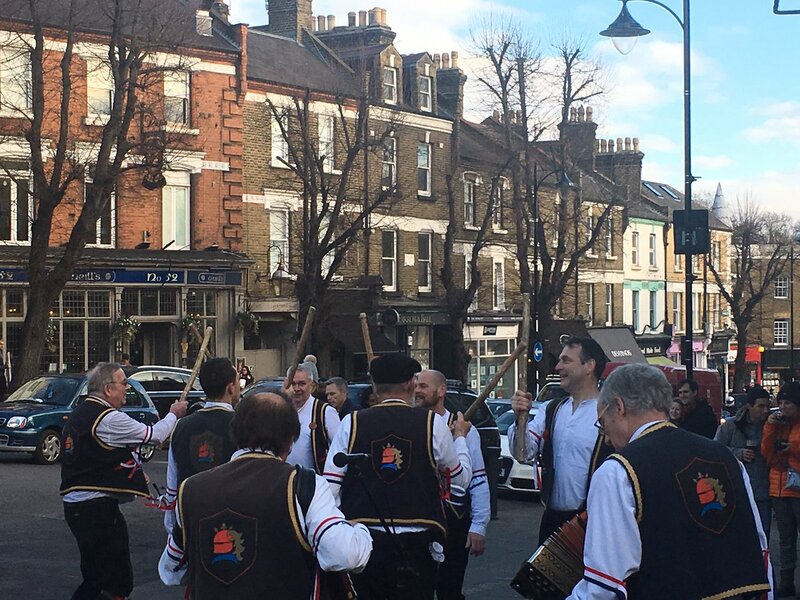 [Though for those around, the Morris Men will be back on Boxing Day!]. And the advantage of taking a more systematic approach to the day, with a programme, branding, and an ever expanding set of ‘draws’, is that the day itself will become better known and hopefully even people will start to come along and spread the word about Blackheath and all it has to offer. But there’s always a trade-off. As we said last year, the big lights switch-on being at Montpellier Green rather than in the middle of the village is a mistake. A number of people were heard to say that once the count-down had reached its climax it wasn’t actually possible to see the lights (apart from the really nice ones around the nearby trees, which were already on) from where everyone was gathered. Talk about an anti-climax. Keep the stage, keep the procession to it, expand the events and who performs, but have the switch-on itself back in the village! 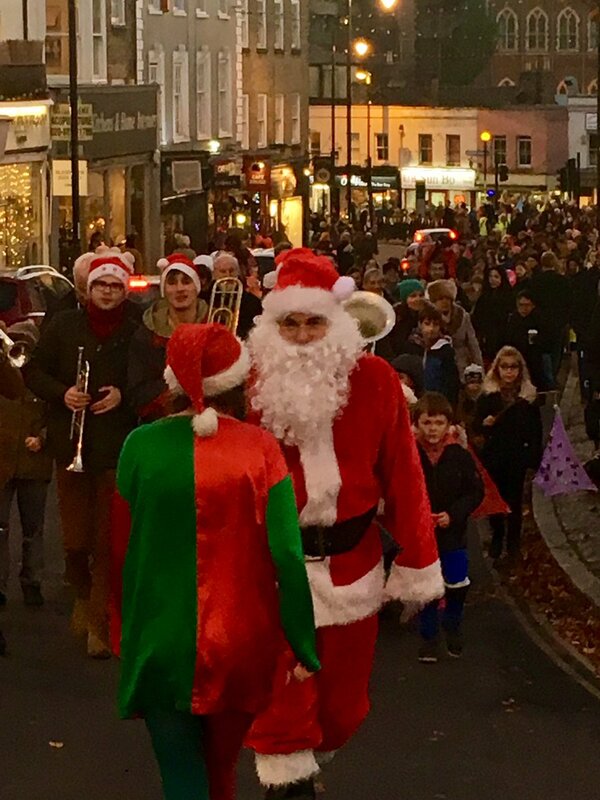 Oh, and the ‘Blackheath Santa’ may have done a good job in leading the kiddies and their lanterns through the village, but as a master of ceremonies for the highlight of the day, he was pretty underwhelming. Apparently local favourite Nick Ferrari was busy this year. What did you think? As usual the Revolt enjoyed proceedings, more and more as the mulled wine flowed in fact, and came away feeling very glad to live in such a jolly place with such great people. Following the summer break and silly season (okay, quite a long one since the last post) and a bit of a Twitter hiatus (easy to get out of the habit of checking!) the Revolt has become increasingly concerned about the amount of speeding on our local roads and the recent introduction of more 20mph zones is now exacerbating the problem. The worst problems had been on the major routes – Shooter’s Hill, A2, Lee Road, Lee High Road, Burnt Ash Road – where drivers routinely ignore the speed limit. Now anyone walking or driving in the new 20mph zones can’t help but notice that very few drivers abide by the new limit. This is no surprise. There appears to be little to no enforcement which then makes a mockery of the speed limit. Certainly this Radical’s experience both driving and on foot in the 20mph zone that stretches through Hither Green and Lee is that most ignore a zone that has been in place for many years. Much traffic heading across the heath on the A2 or up Shooter’s Hill seem to treat it as 40mph, as they do on the A20 through to Lewisham. This is not just ‘outsiders’ and people passing through as many locals choose to ignore the limit too. It is a disgrace that so many drivers of all vehicles – although of greatest concerns are the larger vehicles, including TfL buses – can and do regularly get away with speeding. What is the point of a 20mph zone if it is not enforced? The Revolt is not against 20mph (and has been abiding by the new limit). We know the difference just a few miles an hour makes in an accident with a pedestrian. The Revolt supports 20mph where it is appropriate, such as around schools and narrow roads, and where resources can be focused to enforce it. Reducing the speed limit in such an unfocused way (or as a response to speeding) risks being seen as tokenistic rather than actually being effective. Targeted zones can have a greater impact as drivers are more likely to take note of and be more inclined to slow down for a short stretch of 20mph than a large zone. Lewisham Council’s reasoning is here. Which brings us back to the main problem, regardless of the limit, of speeding. It appears that many drivers believe they can get away with speeding because they see no risk of being caught. The odd speed camera is not a deterrence – as we all know someone speeding will slow for the camera and speed up again. Speed bumps have some impact but many simply accelerate between them or for the square bumps take dangerous action to avoid them. The Council and police need to work closely together if we want to reduce speeding in the area. Where were patrols as the new 20mph was introduced? Every day in those first couple of weeks this Radical was amazed by the lack of any sort of monitoring. And let us be clear, we are not talking about the odd speeding car but the vast majority of vehicles flouting the new 20mph limit. At the very least pulling drivers over to alert them to the new limit would have been good. A particular concern is also that many bus drivers speed in 30mph zones and seem to be unaware of the new 20mph limits (your Radical had a bus race up behind whilst doing 20mph on Prince of Wales Road). There is no doubt some worker’s rights reason is deployed why it is not sensible to regularly monitor bus maximum speeds but that frankly should not be acceptable. The Revolt would hope our local representatives and the police are aware of the many spots people speed but is there anything the public can do to help? The Revolt has been tempted to name and shame commercial vehicles seen speeding as the company may be willing to act against drivers. Can we do more to report and map the worst areas and to report buses speeding but what could the authorities do with that information? And no, let’s not have the answer as more ‘traffic calming’. As noted, the new zones and existing speed bumps are not the panacea some will claim. Just take a walk down Lee Park where there remains plenty of speeding despite speed bumps and the new 20mph limit, or sit in Halcyon books on Lee High Road for an hour to see what difference a couple of speed cameras make. Would targeted 20mph zones have greater effect with drivers taking notice? The Revolt expects that 20mph zones are here to stay and it seems that in London at least, many councils are now introducing blanket 20mph areas with little thought to their relevance or effectiveness. The Revolt is aware that the answer will almost certainly be resources for enforcement (not more signs and zones) and speeding will be a low priority. A good experiment would be to monitor speeds on some of the routes mentioned as well as in the new zones. A week of focused police resources on enforcement might also make the point that speeding is a problem as well as catch a good number of drivers. That will only highlight the problem but might spur some thought, proposals, and action to deal with this epidemic. Taking inspiration from the Steve Coogan and Rob Brydon series ‘The Trip’ the Revolt packed up the mini-metro and headed north at the start of July. It started with the Blackwall tunnel, M11, M25 (mercifully clear), M1, M6. Then off at junction 31 and in to the magnificently titled Trough of Bowland (yes, we were in a trough). And you will no doubt be assured that the Revolt always carefully plan routes in advance using a map and so on this trip, as with others, had no need to fall back on a ‘satnav’. For those contemplating travelling north west the M6 Toll is worth the £5.50. It is a wonderful stretch of asphalt free from HGVs blocking two lanes and light on traffic – must have been what motoring was like back in the day. The first stop, making it with fifteen minutes to spare (carefully planned route undone by a flood-damaged bridge and diversion just outside Whitewell), was lunch at the Inn at Whitewell. A fine pub with a church attached, the sort of random spot for fine meals that mixes locals and weary travellers. Including some with a distinctly far-flung twang to their accents when we were there (Americans) as well as a bunch of people there for a wedding. Hamlet would probably be to over-state the size of Whitewell and the Inn itself is part of what was Whitewell Manor and made its name as an Inn during the trial of the Lancashire witches in 1612.
goat cheese in filo pastry (surprisingly light) and a fennel soup (refreshing) to start before moving on to slow roast pork belly and bangers and champ. The food was simple, effective, and fantastically cooked. No pretentions but high quality (the pork just melted in the mouth) and service was excellent and was only improved by the traditional panelling and décor of the room. None of your gastropub pastel shades or unnecessary mismatched furniture. The Inn oozed character and with the exceptional quality of the food did not need to try to impress. It really did put gastropubs to shame on the food and décor fronts. More so when the bill, including a couple of local pints, a large glass of red, and coffee, came to £66 for two. Talking of coffee, a recurring theme of the trip was the different policies places offer to the stuff, with some offering a cafetiere and that’s it and others having a somewhat wider range (including your fancy espressos, machiatios, double espressos, etc…). Anticipating which policy which establishment would adopt at the end of the meal added a frisson to proceedings (yes, it was a long trip…). Suitably content we took the short drive to Slaidburn and our overnight accommodation. The drive took us through the centre of the United Kingdom at Dunsop Bridge (so it claimed so all correspondence to them please) and a bit of ‘air’ when your driver misjudged a small humped bridge. Day two was the day off from lunching and certainly any heavy meals. Nipping down the A65 (and passing from Lancashire to Yorkshire) we headed for Bolton Abbey at the bottom of the Yorkshire Dales. Aside from a few spots of rain the weather held and we embarked on a c.7 mile wander around the estate. Slightly unnerving and perhaps an omen to our attempts to do four lunches in five days we came across a signpost to ‘The Valley of Desolation’. With that in mind, and with a rather high and fast flowing river, the famous stepping stones were out. A few hours later, duck race raffle ticket in hand (where to start? ), it was back to the mini metro just as the heavens opened and the next leg of the trip. The Pheasant Inn at Casterton, just outside Kirkby Lonsdale (for some reason no-one pronounces the second ‘k’, so it is ‘Kirby’), was the overnight stop. A random selection as all (reasonably priced) rooms in KL were taken. But it turned out to be a fine choice. Large, well-appointed rooms (twin room, B&B, £110), pleasant bar with local ales, nice garden, and although not originally planned as part of the trip, a fantastic restaurant. After the compulsory wander around the village it was decided on dinner at the Pheasant rather than heading in to KL. Whatever we may have missed out on (there was no plan for eating in KL), we were certainly not disappointed by The Pheasant. A fine panelled dining room greeted us and the plans for a meal ‘lite’ day went by the wayside. Local smoked salmon and crab whetted appetites. Beautifully cooked local beef medallions (washed down with a Pinotage) left us rather satisfied. Being our day off we skipped dessert – well, one of us had a rather good panna cotta – and moved on to coffee (yes, an espresso!). £90 for two, including booze. Feeling a little guilty, and with an early lunch planned, breakfast was light. A brief tour of Kirkby Lonsdale – pleasant enough but mostly tea rooms and pubs – introduced us to what Ruskin declared to be “The greatest view in England and therefore the world”. Jolly pleasant view of the River Lune and hills but we’ll reserve our judgement. Hipping Hall, just south of Kirkby Lonsdale on the A65, was the lunch venue. As we took in the discreet but rather fine building with a tastefully modernised entrance extension, it belatedly occurred that this one could be a bit expensive. Drinks in the very comfortable lounge and a complementary venison pasty with cranberry ketchup (rather tasty) only notched up the tension. A copy of The Observer Magazine (who, sadly, unlike Coogan and Brydon on their trip had not been picking up the tab for ours) provided distraction until the menu arrived. Three course a la carte menu for… £29.50. We decided to stay. horseradish panna cotta with fresh peas and pea puree. This was also our first experience of having the dishes described to us – given this Radical tends to forget the order immediately after placing it this is quite helpful. The staff were excellent – a quietly confident air and no nerves about remembering the composition of the dishes. The poached egg and smoked eel was a pleasant surprise and your other Radical almost converted to vegetarianism after a very nice tomato and green pepper dish. Ling (a bit like cod) with a lobster bisque was very well done although the bisque a little rich for this Radical’s palate. Continuing the veg theme on the other side of the table a filling gnocchi and cheese dish was consumed. Languedoc white was an excellently recommended accompaniment to the meal. Cheese – a selection of six laid out based on strength and expertly remembered by our waitress but not by your Radical – and port finished things off (£5 supplement to the set price). On to the terrace for sunshine and coffee which was accompanied by fudge and fruit jelly cubes, and the conclusion that we’d expect to pay three times more for the food and service down in London. We were then hit by the realisation that at some point we’d have to leave and head on to our next destination. Ambleside (A65, A590, A592, and then up through Windermere) was the staging post for the next lunch. The Unicorn Inn provided beds for the night. Again a basic pub with rooms but it suited us – especially as Ambleside is quite pricey. We quickly discovered why as although a small town it was busy with tourists and walkers. The latter are a strange breed. Rather like golfists they have a uniform of sorts. Brightly coloured clothing, always waterproof, and regardless of the conditions we saw a lot of people sporting shorts. They seem to exist to talk about past walking glories (yes, we got caught by some in the pub) that ultimately boil down to “We went for a walk and it was a bit hilly and the weather did/nearly came in”. By far the best pubs in the place are the Unicorn Inn itself and, one minute round the corner, the Golden Rule. Both authentic choices for a comfortable evening. The following day and a short bus journey (or, as two old dears said as the tickets were bought, a short walk for two strapping lads) away was Holbeck Ghyll. Suitable chastened we attempted to walk at pace up the drive. The hotel (as with Whitewell and Hipping Hall rooms were available but very pricey), sits atop a hill on the road to Troutbeck with views back down to Windermere. The terrace was a very pleasant place to take in the view and a G&T (gin from the local Langton’s distillery). Macadams and bread enveloped cheese truffle came with the menu. Two courses £33, three for £43. expect hearty and traditional meat and two veg options with lashings of gravy. That would be a mistake. The amuse bouche was a parmesan panna cotta with onion veloute. Then on to the mackerel teriyaki (slightly odd texture combinations but tasted excellent) and chicken terrine with a variety of beetroot styles. Local lamb had all the classic elements, was presented well, and tasted fantastic. The salted cod with shrimp and lemon emulsion (the only foam of the trip) was refreshing to taste although the red onion bhaji added a different and rather heavier twist to the plate. Cheese followed (English and French). Half bottle of pinot noir (with the largest wine glasses known to man) for the lamb and a bottle of the picpoul de pinet for the starter and fish. As the rain came in we retired to the lounge for coffee – initial excitement at what looked like a carafe of brandy dissipated when it turned out to be the vessel for the coffee. All in, £149.80. Taking advantage of a break in the weather we dragged ourselves out of the comfy chairs and back down the hill for a bus journey to Grasmere and a bit of culture at the home of Wordsworth: Dove Cottage. Our luck with the rain ran out and we dripped our way around the cottage (wonderfully droll tour guide), skipped the gift shop and went to the pub. Unlike Ambleside, Grasmere is almost devoid of pubs. We got rather soaked travelling between the one in the village and one on the outside of it. Giving up on public transport we got a taxi back to Ambleside (and the more closely packed pubs). By this point we’d managed two exceptional meals in pubs and fine dining for reasonable prices at two restaurants. The next morning was the trip to Cartmel (travelling west of Windermere, via Hawkshead). Cartmel is an exquisite little village with a fine priory and a race course. There is a small central square that hosted two pubs and a hotel, with another pub about 20 yards away up another road. Add to this a renovated yard that hosted a cheese monger, micro-brewery, and wine shop and you’d forgive the Radicals for wanting to heap praise on the place. We stayed at the Royal Oak. The rooms were modern, comfortable and nicely furnished (twin room, B&B, £75). With the mini metro parked up we had a quick pint at the Cavendish Arms and contemplated lunch. This was unknown territory. L’Enclume offers 2 Michelin starred Simon Rogan dining and we were not sure what to expect. Refreshingly the venues so far had been down-to-earth and in no way intimidating despite the excellent food on offer (maybe we’re just used to too many places in London being a bit up themselves). much to contemplate – ordered we settled in. Despite the length of stay the chairs remained comfortable and the atmosphere was relaxed. We opted for the wine selection to go with the taster menu so had a sherry, two whites, a red, and a dessert wine. This felt like a bit of an extravagance but at £40 was not much more than would have been spent on selecting several glasses and with the variety of food we could not have picked one bottle to go with everything. And it was worth it. The selections accompanied each course wonderfully – always good to taste the wine on its own and then experience the difference when having it with the food. Getting on to the food, it was exceptional. Unfussy, which was another concern, and fantastic tastes. In short the six courses were made up of: cod ‘yolk’ with pea, salt and vinegar; turnip broth; grilled onions with goats curd, chicken and yeast; guinea hen; gooseberry and buttermilk; and yoghurt with strawberry. Sounds simple, was very effective and frankly words can’t quite do it justice. Followed up with a selection of cheese – five from an overwhelming selection, but the cheese waiter (that might not be the official title) was able to describe each one to help with the decision. A fine end to the trip, we concluded, as we sat in the garden having coffee prepared. For it was indeed prepared, being filtered and stirred very slowly in front of us and this may have been the one slightly unnecessary nod to the Michelin stars. The coffee was good, but probably not worth the process it went through. But we and the waitress saw humour in this (again, that unpretentious and relaxed atmosphere) and it did not blemish our 3hrs or so of lunch. It would be foolish to pick a favourite restaurant or meal. Each does its own thing and does it very well. This little cluster of restaurants was certainly worth the trip and we end it rather satisfied. Alongside the food, and in homage to the original Trip, were, as you might imagine, a series of rather painful impressions of such celebrities as Michael Caine (‘she was only 16!’), Roger Moore (‘Belt and braces, belt and braces’), Al Pacino (‘Hello!!!!! !’ / ‘Whaddya got? !’), and many others from Alan Bennet to Ken Bruce. You had to be there. The Revolt is now taking time to detox. Your Radicals are leaving. No, not out of panic, in a hissy fit, or for good (sorry). We need to make this work and taking heed of advice that now is a period for calm reflection and taking the pulse of the nation… (don’t get political… Ed.) we’re off on a short trip to the North. Why on earth would you be interested in the movements of the Revolt? With Twitter we will never be far from local news and goings on and it would be as if we were in our living rooms, and I daresay you wouldn’t notice we were being intrepid had we not told you. The Revolt has been irregularly reviewing local establishments since our inception and have decided it is quite good fun. What better then to combine a trip up to the Yorkshire Dales and the Lake District with a bit of a culinary tour. Those familiar with the 2010 Coogan/Brydon series ‘The Trip’ may see a parallel. This is absurd. The Revolt will tour only four of the six restaurants and in a different order. And our Michael Caine, Roger Moore, Richard Burton, et al. impressions are not as polished. We were inspired mind you, but when reviewing the route taken by Messers Coogan and Brydon and applying our well honed logistical skills (many a road trip has been planned before, and this one was done in the newly refurbished Red Lion on Shooters Hill Rd) we realised the route they chose was not the best way to do it. We are also pretty certain no-one else will have thought of doing this before, in the same way no-one will have shouted ‘I don’t believe it!’ when seeing Victor Meldrew actor Richard Wilson, or ‘You’re Fired!’ to Lord Sugar. We’ll be packing the boot of the mini metro (be assured, it will be well packed) rather than a Range Rover and heading for the Inn at Whitewell in the Trough of Bowland first (admittedly this was the staging point for the other chaps too), staying at the rather fine sounding ‘Hark to Bounty’ in Slaidburn – cue Anthony Hopkins impressions from ‘Muting on the Bounty’ (god help us, Ed.). From there the obvious way to go is on to Hipping Hall in the Yorkshire Dales for Sunday lunch, via a day trip on Saturday to Bolton Abbey (not, confusingly, anywhere near Bolton). Staying at The Pheasant just outside Kirkby Lonsdale. Ambleside in the Lakes is next with lunch at Holbeck Ghyll on Monday. By this point your Radicals may be in a Roger Moore impression stand-off. A couple of nights at the Unicorn Inn. The final stop will be Cartmel and L’Enclume, with a night at the Royal Oak Inn. Routes have been planned in detail, packs prepared, tyres checked (kicked knowingly), and we’re almost ready for the off. So, with apologies for the self-indulgence, you will no doubt see a few tweets and a write up of this trip. Possibly the best sign in the world? Another year passes and so it is back to the South East London CAMRA Beer Festival held for the third year at Charlton Park RFC in Kidbrooke. Your Radicals attend many of the beer festivals in the London area (and sometimes even venture further) but the local one has become a firm favourite. Excellent location – as always well signposted from Kidbrooke station – and well organised. The festival appears to be getting more popular as a few beers had gone by the time The Revolt arrived on Saturday lunchtime. Well, one Radical arrived at the allowed time but as always things did not quite go to plan with the other Radical arriving late after taking a rather circuitous route from Shooters Hill Road. Still, that allowed a cheeky primer half and recon of the venue. Avoiding the temptation of settling in the club bar to watch the cricket your Radical selected the Bexley May Place Spring (6.5, 7.5*) and sat in one of many chairs outside (is ‘on the terrace’ too fancy?). As the sun broke through your Radical remarked to himself (other Radical still AWOL) that this was indeed the life. After much nursing of the half ** word came through that your other correspondent had found someone in a festival t-shirt to follow and not too much time passed before he arrived. *For the uninitiated The Revolt operates a simple scoring system of 0-10. 0 being a very bad pint, 5 is okay, nothing fantastic but not poor, 6-7 are decent beers, 8-9 denotes excellent. A 10 is unheard of (we assume the scorer would be rather tired and emotional to give such a score). The system as been criticised in the past as most scores fall between 5 and 8. We remain committed to it and newcomers are quickly initiated over several halves and a few “Are you sure?” comments and raised eyebrows until they start scoring properly in the 5-8 window. The scores listed are those given by each Radical. Where we both had the same beer there are two scores. I don’t see what the problem with the scoring system is. **Always select the pint glass option but in order to be able to try many beers good beer festival etiquette is to get half pints. This also prevents one from getting too sozzled. Next up was Brew Buddies Best (6.5) and George’s Buddy (6.5) and a contemplation of the scene across the sports fields to Shooters Hill. All jolly green and pleasant and the cricket was going very well too. On to the Brockley Red (7), Caveman Neolithic (6.5), Clarkshaws Pheonix Rising (6) and Strange Brew (4), Godstone Ponytail (6), Hop Stuff Renegade (7.5)… Okay, you get the picture and we had several more halves as the afternoon progressed. By the time we were halfway through the beer list all the seating outside was taken and a few families had positioned themselves on the grass. At that point there must have have been 60 people outside and a few more inside. With the numbers the beer started to run out, as is to be expected on the last day of a beer festival, but the Revolt was not disappointed by the 14 beers sampled. And the winners I hear you ask? Well, one Radical scored the Peerless Gold an 8, and the highest from this Radical was a tie on 7.5 between the Hop Stuff Renegade and Kissingate Powder Blue. These festivals are organised and staffed by volunteers and so our thanks must go to Festival Coordinator Anna and all the volunteers. Regulars will know The Revolt has wide tastes and to balance the beer out we made our way down to the village and popped in to Le Bouchon to reflect on a fine afternoon.